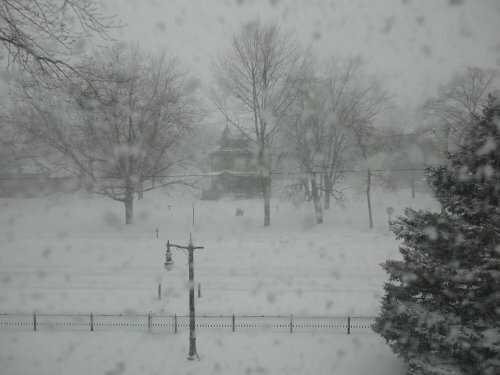 This is the view as I work in my studio on this blustery, snowy day. 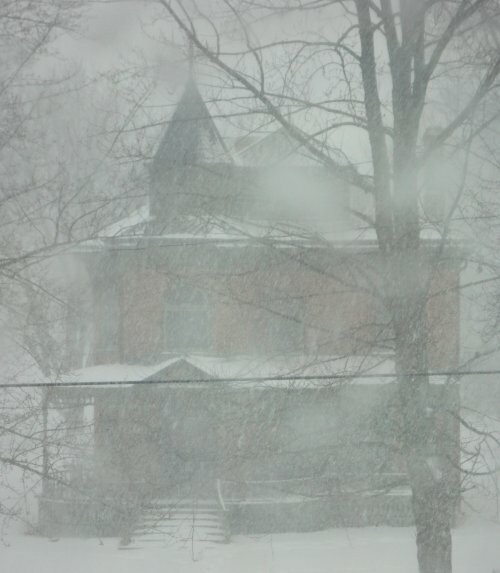 The house you see is the historic Beyer Home, a lovely Queen Ann house. I so enjoy looking at this beautiful old house every day, what a blessing! 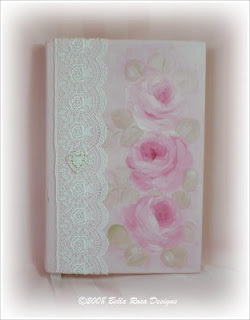 New items coming to Bella Rosa Designs today! The other morning I received an email from a very dear friend of mine. Seems it was snowing that day — this doesn’t happen often in South Carolina — so she took advantage of the weather to send a message — LYLAS — which is internet speak for “love you like a sister”. What a wonderful start to my day. Love you, Mar! 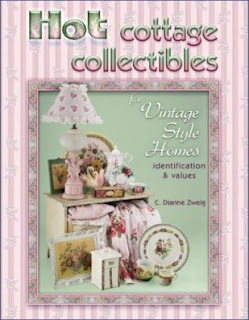 I am excited to announce that some of my antique and vintage items (including hand painted pieces) are featured in a new book by C. Dianne Zweig titled Hot Cottage Collectibles. It will be available this fall and can be preordered at Amazon.com. 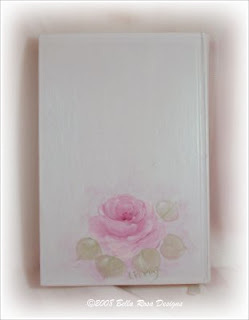 I certainly wouldn’t sell an imperfect piece like this so I decided to turn lemons into lemonade – I will be giving it away. Because I really do need to get the hang of this blogging thing and also because it’s more fun when you’ve got company, I will give everyone who posts a comment on my blog a free entry in my Bible giveaway – so post away – you can get one contest entry for each post you make until the contest ends (reply to any of the posts, even those in the archive). 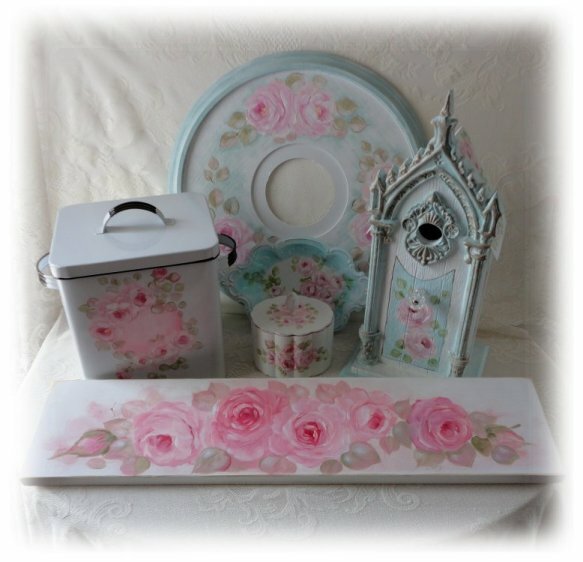 The winner will be announced here as well as on my website. 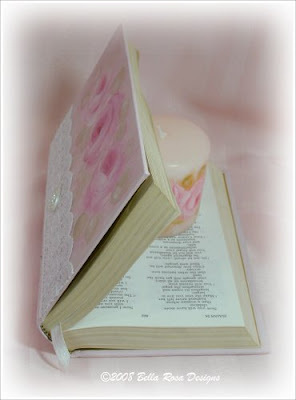 In the first picture, I attempted to show the upside down book/text. It’s difficult to see in the photo, but trust me, it is backwards. lol. 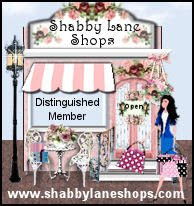 Bella Rosa Designs is proud to be a distinguished member of the new Shabby Lane Shops! Watch for ads in upcoming national magazines starting in March! Today I will take time to slow down and truly appreciate just how much my friends mean to me. 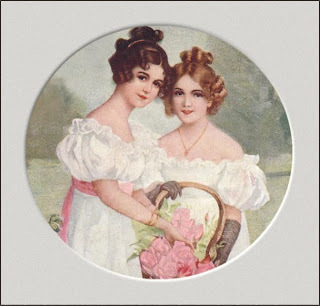 I have been blessed with the most wonderful friendships for which I am very grateful. It’s all too easy in this hustle and bustle world to forget to take time for those we love. Please remember to let your friends know just how much you care about them, even if it’s just a quick email – so simple to do, yet means so much. 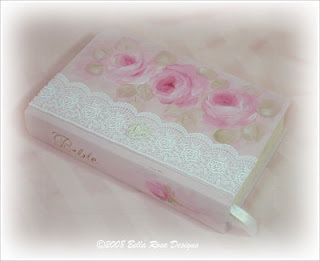 Copyright © 2009 bellarosadesigns.com. All Rights Reserved.